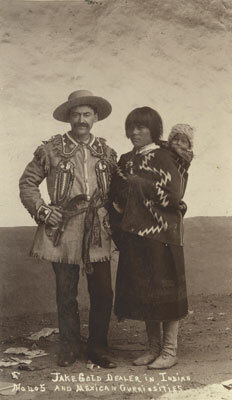 Jake Gold and unidentified Pueblo woman with child, ca. 1885–1890. Photographer unidentified. Photo Archives, Palace of the Governors, Museum of New Mexico/Department of Cultural Affairs, Santa Fe, 9894. From May 18, 2008, through April 19, 2009, the Wheelwright Museum of the American Indian presents a major exhibition, From the Railroad to Route 66: The Native American Curio Trade in New Mexico. Representing the culmination of nearly two decades’ research by Wheelwright director Jonathan Batkin, the exhibition is accompanied by a 336-page, full-color catalog, The Native American Curio Trade in New Mexico. Starting with the arrival of the railroad in 1880, Pueblo and Navajo artisans collaborated with non-Indian dealers to invent artifacts that had no purpose but to satisfy the demand for Indian goods. From its inception, the curio trade comprised cottage industries, retail spaces, and a vast mail-order trade, and objects were sold by the thousands. Early in the 20th century businessmen in Denver invented “Indian style” jewelry, made with the aid of machinery. In the 1920s machine-assisted jewelry production spread to Albuquerque and Santa Fe, and hundreds of young Native American men moved to the cities to work in the curio shops. Observing a jeweler at work and obtaining a piece of Indian jewelry became an integral part of the touristic experience in New Mexico. The experience, however, was not without controversy. Production methods in the shops threatened native traditions and economies, affected the teaching of silversmithing in the Indian schools, and eventually led to federal scrutiny of and control over shop-made jewelry. Unidentified workman at 110-ton press, Maisel’s Indian Trading Post, ca. 1950. Photograph by S. L. Maisel. Collection of Mr. and Mrs. S. L. Maisel. 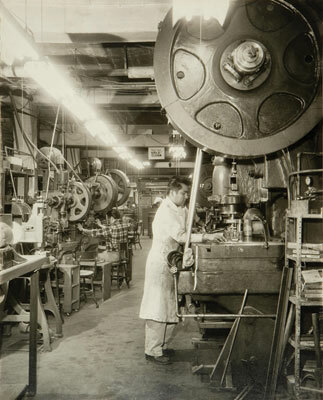 Nevertheless, many young men who learned silversmithing in curio shops had successful and celebrated careers as jewelers following World War II. Among the artists included in the exhibition are Mark Chee, Ambrose Roanhorse, David Taliman, and Manuel Naranjo. The rich, complex, and controversial story of the curio trade in New Mexico is told here for the first time. It is not only a story about artifacts, but also of personalities, innovations, perseverance, and ultimately the survival of traditions. Founded in 1937, the Wheelwright Museum of the American Indian offers changing exhibitions of contemporary and historic Native American art with an emphasis on the Southwest. Exhibitions feature works by established and emerging Native American artists and photographers. The Wheelwright is conveniently located at 704 Camino Lejo on Museum Hill in Santa Fe. Museum hours are Monday through Saturday 10-5 and Sunday 1-5. To learn more about the current exhibition or to reserve a signed copy of Jonathan Batkin’s new book, please call 505.982.4636 or visit www.wheelwright.org. This exhibition is made possible by the National Endowment for the Humanities; the Thaw Charitable Trust; the City of Santa Fe Arts Commission and the 1% Lodgers Tax; New Mexico Arts, a Division of the Department of Cultural Affairs and the National Endowment for the Arts; the Stockman Family Foundation; and many private donors. This article was excerpted from Canyon Road Arts: The Complete Visitors Guide to Arts, Dining and Santa Fe Lifestyle, Vol 4, 2008-2009, pages 86-87. Canyon Road Arts is published by Medicine Man Gallery. All rights reserved.